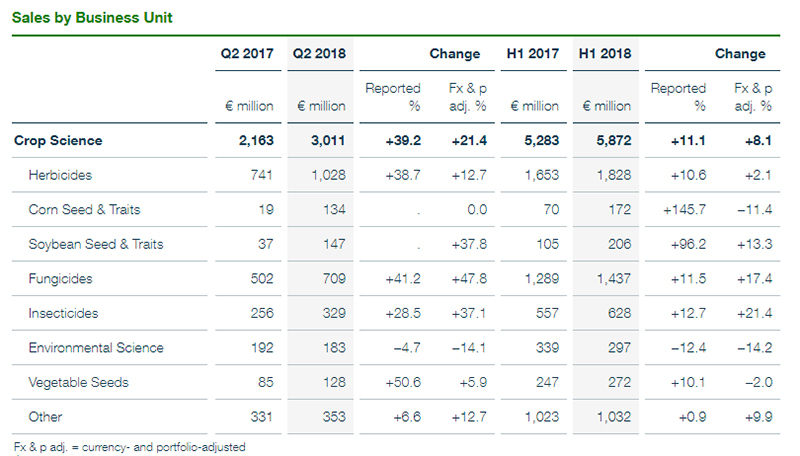 In the second quarter of 2018, Bayer Crop Science posted sales of €3,011 million. The businesses being divested accounted for €468 million of this figure. 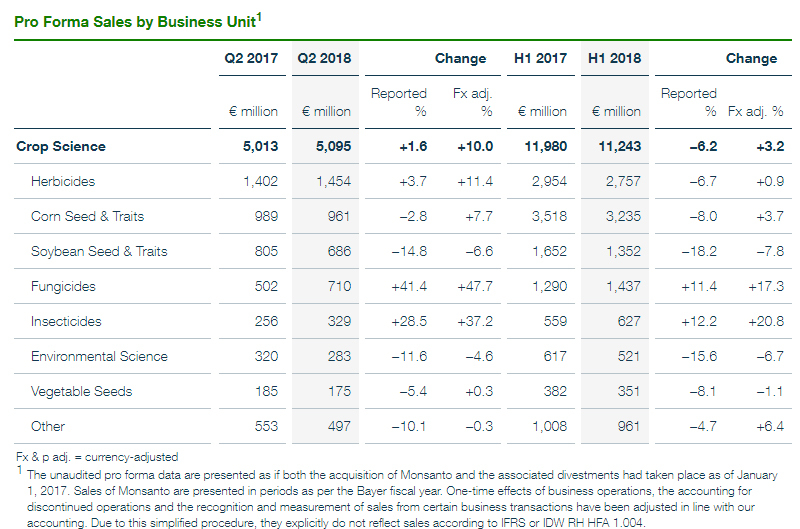 Sales increased by 39.2% on a reported basis, thanks mainly to a positive portfolio effect of 25.0% (€543 million) from the acquisition of Monsanto. There was also a negative currency effect of 7.2%. On a currency- and portfolio-adjusted basis, sales increased by 21.4%. This development was largely attributable to significantly higher provisions for crop protection product returns recognized in the prior-year quarter due to high inventory levels in Brazil. Inventories in the distribution channel there have normalized as a result of the measures undertaken. The company has adjusted Group outlook to account for the sales and earnings contributions from Monsanto since the date of the acquisition. As the transaction closed later than they had anticipated, 2018 earnings will be lower than they had projected in February forecast including Monsanto due to the seasonality of the agricultural business. The outlook takes into account the financing costs for the acquisition of Monsanto shares as well as the higher number of shares of Bayer AG following the capital increases on a pro rata temporis basis. The businesses divested to BASF are no longer taken into account from the date of their respective sale. 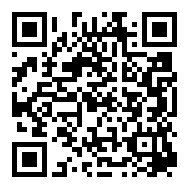 With the acquisition of 100% of the outstanding shares of Monsanto Company, St. Louis, Missouri, United States (Monsanto), for US$63 billion including debt on June 7, 2018, Bayer completed the biggest acquisition in its history. 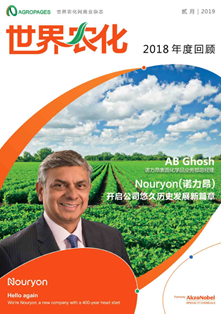 The acquisition of Monsanto brings together two strong and highly complementary businesses: Bayer’s innovative chemical and biological crop protection portfolio and Monsanto’s exceptional expertise in the field of seeds and traits. 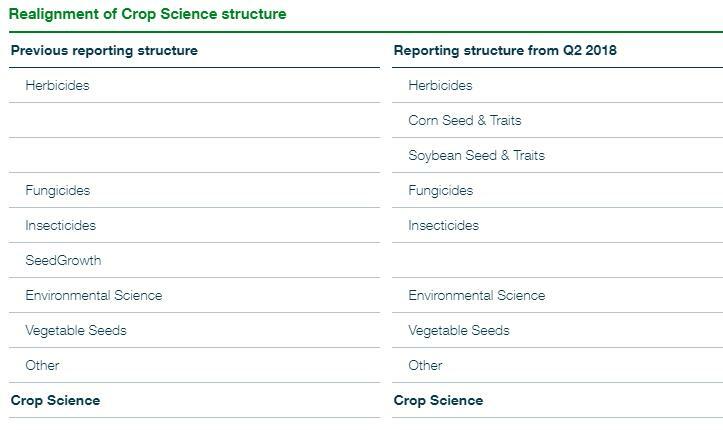 In connection with the acquisition of Monsanto, the reporting structure of the Crop Science segment was adjusted to reflect the future relative sizes of the various strategic business entities. The figures for previous periods were adjusted accordingly. Due to the relative sizes of Monsanto’s “Corn seed and traits” and “Soybean seed and traits” businesses, Bayer will report corresponding strategic business entities Corn Seed & Traits and Soybean Seed & Traits separately from now on. Monsanto’s “Agricultural Productivity” business will be allocated among Herbicides, Environmental Science and Other, while “Cotton seed and traits” and “All other crops seeds and traits” will be reported under Other and the “Vegetable seeds” business will be allocated to the corresponding Vegetable Seeds business entity. Due to its relative size, Bayer will no longer report its SeedGrowth business separately, but under Other. Regional reporting will not be impacted by these changes. •	Sales in the Europe / Middle East / Africa region climbed by 12.7% (Fx adj.) to €986 million. The acquired Monsanto business contributed €65 million to this figure. Sales increased by 5.5% on a currency- and portfolio-adjusted basis. Fungicides performed particularly well, benefiting from catch-up effects from the delayed start to the season in France and a successful product launch in Germany. Sales also increased at Herbicides. By contrast, there was a decline at Environmental Science. •	Sales in North America advanced by 31.0% (Fx adj.) to €1,076 million. The contribution of the acquired Monsanto business was €284 million. Sales fell by 1.9% on a currency- and portfolio-adjusted basis, due chiefly to intensified competitive pressure at Herbicides in the United States and to a significant decline at Environmental Science as a result of planned lower product deliveries to the company that acquired the company’s consumer business in 2016. These effects were partly offset by higher license revenues for soybean seed in the United States. 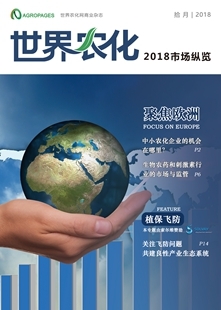 •	In the Asia / Pacific region, sales increased by 18.7% (Fx adj.) to €508 million. The contribution by the acquired Monsanto business was €38 million. The company posted an encouraging 10.2% sales increase on a currency- and portfolio-adjusted basis. 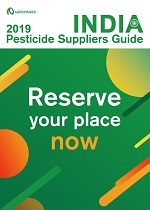 The company registered double-digit-percentage increases in sales at Insecticides, due particularly to the weak prior-year quarter in India, and at Fungicides, due to a product launch in China. Bayer also considerably expanded business at Herbicides, especially in Australia. 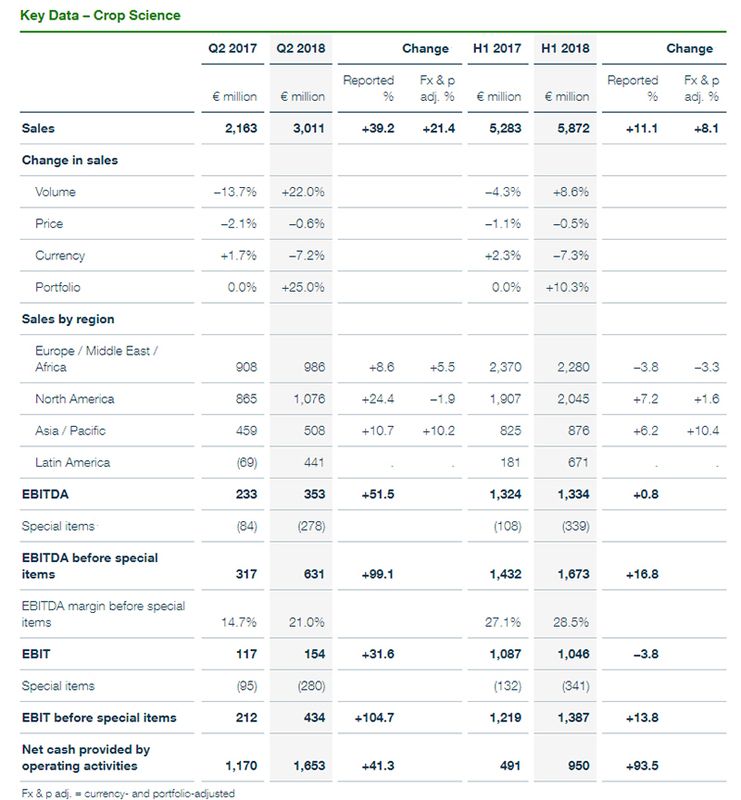 •	Sales in the Latin America region increased to €441 million (Q2 2017: minus €69 million). The contribution by the acquired Monsanto business was €155 million. After a negative currency effect of €25 million, the currency- and portfolio-adjusted sales increase was largely attributable to the significantly higher provisions for crop protection product returns recognized in Brazil in the prior-year period due to high inventory levels. 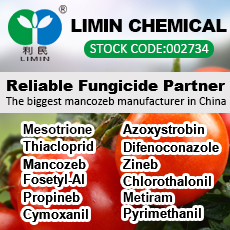 The related measures undertaken to normalize inventories of crop protection products were successfully completed at the end of the season during the second quarter. Excluding Brazil, the other countries in the region registered a slight increase overall. 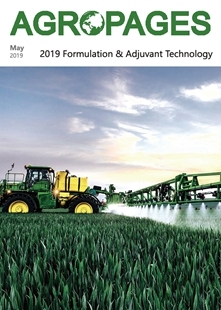 Due to the scope of the acquired activities and the seasonality of the business, Bayer is presenting sales by strategic business entity on an unaudited, pro forma basis, to better show the operational business development for the combined business of Crop Science and Monsanto, among other reasons. In this context, sales are presented as if both the acquisition of Monsanto and the associated divestments had taken place as of January 1, 2017. •	The increase in sales at Corn Seed & Traits was predominantly attributable to a one-time effect and associated higher license revenues in Brazil, as well as expanded volumes due to a late start to the season in North America and eastern Europe. •	Sales at Soybean Seed & Traits were down, primarily as a result of a challenging market environment in the United States. This was partly offset by the higher level of market penetration achieved by Roundup Ready 2 Xtend™ in North America and by Intacta RR2 PRO™ in Latin America. 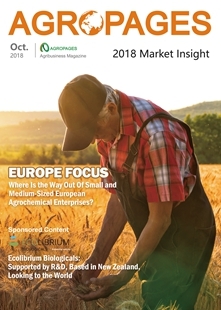 •	Sales growth at Herbicides, Fungicides and Insecticides was largely attributable to the significantly higher provisions for crop protection product returns in Brazil recognized in the prior year, as previously outlined. Higher prices at Herbicides also had a positive impact. 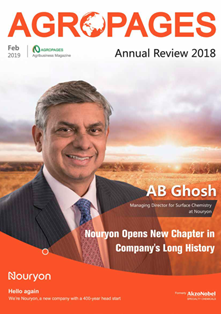 •	The company registered a decline in sales at Environmental Science as a result of planned lower product deliveries to the acquirer of consumer business.